« The Beginning of the End of the "Israel Lobby"
With Biden’s speech at so central a DC event as the AIPAC conference, it is clear that the issue of settlements is now as central in the diplomatic arena as it has been for years on the ground. This is good news but resolving the settlement question will not be easy. The politics around it in Israel are complex, and even if an agreement is reached with the Palestinians, any withdrawal of settlements will take time. But in the meantime, there are steps that can be taken to ease the human rights conditions for Palestinians and start to repair Israel’s reputation. Removing outposts and freezing construction in the West Bank, as President Obama has proposed, can contribute to both of those goals, if they are pursued properly. “Outposts” are Israeli settlements established without government sanction. The settlers in these outposts tend to be among the most radical, and frequently harass and clash with Palestinians nearby. This aggravates the already tense situation in the West Bank. 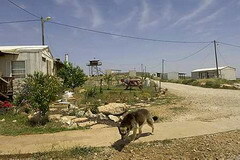 Israeli law deems the outposts illegal, unlike the more than 120 settlements (generally viewed as illegal under international law, though Israel disputes this) that Israel has officially sanctioned. 100 outposts are dotted around the West Bank, and each one makes a mockery of the Israeli commitment to peace with the Palestinians. Israel prides itself on its commitment to the rule of law. The fact that Israel doesn’t act forcefully to enforce its own laws and dismantle the outposts not only undermines Israel’s image as a democracy; it also undermines Palestinians’ ability to believe that Israel is serious about its commitment to a peaceful future for the two peoples. Since the outposts are illegal under Israeli law, there should have been no need for an Israeli commitment to the United States, under the terms of the Roadmap, to dismantle them. Israel still made that commitment, yet neither that promise nor their own laws has compelled Israel to take down these outposts or prevent new ones from popping up. President Obama must, therefore, be very clear with Israeli Prime Minister Benjamin Netanyahu when they meet: Israel must start by fulfilling its commitment to take down all of the outposts. The longer it delays in removing them, the more difficult the task becomes. In order to be effective, a settlement freeze must be total. This means no more “exceptions” for building up existing settlements, halting all construction of roads off-limits to Palestinians, and a compete end to any more seizure of West Bank lands. The US must also commit to working with Israel and the Palestinians to enhance security for both Israelis and Palestinians in the wake of these moves. Israelis in particular must be convinced that Palestinian human rights and Israeli security are not mutually exclusive goals, but are complimentary. The removal of the outposts and a real settlement freeze will be helpful to any diplomatic process. They will also help to bring Israel back, both in the eyes of the world and for itself, to its democratic principles and ideals. And these steps will begin the process of dealing with the question of settlements once and for all. The issue of settlements is certainly not the only day-to-day human rights issues on the ground in the Occupied Territories. Israelis continue to have serious security concerns, and the problems in the Gaza Strip and East Jerusalem are severe and daunting. But a total settlement freeze and the complete removal of outposts would go a long way toward rekindling hope on both sides. People will start to believe again that there are those on the other side who support their basic rights and can be good neighbors. That will make all the tough tasks that much easier. The above alligation ranges from misleading to false, possibly both. Since pre WW1 “Palestine” was 24,000 Sq. miles and included all of Jordan, yes, technically, whatever of it is neither Jordan or Israel is therefore to be called “Palestine”. But the bigger question is: Is it legally Israel? The Plitnick statement is misleading because it wrongly implies that actual Palestinian-Arab people have been removed from land they personally owned to make way for Jewish so called “settlements”. When in point of fact most every square inch of these Hebrew neighborhoods has been built on previously PUBLIC (not private) land, which belonged to the Turkish government for 400 years prior to WW1.. Thus, which ever nation belongs to that land is the nation who rightly controls it and can do with it as it pleases. I submit that the entirety of the West Bank and Gaza legally belong to Israel. The only way it does NOT legally belong to Israel is if one gives the United Nations the authority to redraw national borders, a power it has never had. Because the earlier treaties of Versailles and San Remo, as well as the League of Nations Mandate on Palestine chartered TWO (and only two) new states, those being the “Jewish National Homeland” and, whatever else remained. “Whatever else remained” became Jordan. Whatever DID NOT remain became Israel, although, the two events came transposed–chronologically. Thus, the creation of “Palestine” would constitute a THREE state solution. That said, as a practical matter, millions of non-Jewish people live in the West Bank and Gaza. They are entitled to human rights which ultimately means obtaining some nationality. Israel must either accept them as voting Israelis or otherwise, provide for a third state which the Arabs would control. In the long run, I think Israel has been far more pro-active in the creation of the (third) state then the Arabs themselves, many of whom do NOT want a third state (or even a second state) but only want to possess the Jewish state. But the creation of the third state of “Palestine” is a separate discussion from stopping of building of Jewish neighborhoods. The borders of the new Arab state are for the parties to agree on or disagree on. If the agreed-to borders were to include some Jewish neighborhoods, that is how horse-trading is done. Perhaps the new agreed-to borders might include some Arab neighborhoods inside the final Israeli borders. Perhaps each side gives up some turf. These are all questions to be addressed in tandem by the parties with final agreed-to borders. That also said, if Israel had previously agreed to stop new neighborhood expansion in certain disputed areas, then, they should have to abide by their earlier commitment. I am not certain how these “check-points” factor into the previous Israeli agreements. If they had agreed, then, as before, they should live-up. But I am also certain that eventually, the so called “road-map” can be abandoned by one or both sides. At that point, all interim concessions would become nullified. Ultimately, the Arabs have always demanded what they can’t have. Namely, regional control over the Jews. Peace with the Palestinian-Arabs has never been a matter of the Jews minding their manners—even though that is the load of crap we the public has been endlessly sold for decades. The public always buys it because (for the most part) it enjoys the age old character of “Fagan” the Jew–like an Orwellian Trilogy that never ends.